Author Derrick Hazelwood’s newly released “The Memoirs of an Innocent Man: Extreme Life Tests Create Glorious Testimonies” is a story about faith and personal growth. “The Memoirs of an Innocent Man: Extreme Life Tests Create Glorious Testimonies” from Christian Faith Publishing author Derrick Hazelwood is the story of Damien and his fight to prove his innocence. Through his faith and personal growth, he will overcome allegations of murder and find a new outlook on life. “The Memoirs of an Innocent Man: Extreme Life Tests Create Glorious Testimonies”: a story of faith and personal growth in the face of unbearable trials. “The Memoirs of an Innocent Man: Extreme Life Tests Create Glorious Testimonies” is the creation of published author, Derrick Hazelwood. Derrick is a Purdue University graduate who has overcome many obstacles in his life. He started from very humble beginnings in the inner city of Indianapolis. His background helped foster a strong work ethic and drive for success. His internal motivation helped earn him an athletic scholarship and the opportunity to play college basketball at Parkland College. He received an associate’s degree before moving on to Purdue University where earned his bachelor’s degree. Derrick began writing poetry and books during one of the most traumatizing times in his life as a means to escape the pain. He currently continues to spread love and peace through his Facebook page, STAMP, which is an acronym for “Stand Together And Make Peace.” His twitter, @stamp_nation, is a source for daily words of inspiration that help people continue to overcome trying times. STAMP Nation, (http://www.stampnation.org), is focused on promoting peace throughout the world while uplifting individuals through Christianity. Derrick has dedicated his life to spreading peace. Published by Christian Faith Publishing, Derrick Hazelwood’s new book is a story of faith and personal growth. Until faced with the most daunting challenges and the most devastating tragedies, no one truly knows how they will react. Accused of murder, Damien suddenly finds himself on a journey filled with love, deceit, betrayal, and faith. He must overcome unbearable trials through faith and personal growth to prove his innocence. There is a saying which goes, “God does not give us more than we can bear.” When Damien’s burdens get too heavy, God lightens the load. As he faces tragedy and persecution, he will be transformed through personal and spiritual growth. Not only will his faith in God shepherd him through a horrific experience, it will change his outlook on life forever. View a synopsis of “The Memoirs of an Innocent Man: Extreme Life Tests Create Glorious Testimonies” on YouTube. Consumers can purchase“The Memoirs of an Innocent Man: Extreme Life Tests Create Glorious Testimonies” at traditional brick & mortar bookstores, or online at Amazon.com, Apple iTunes store, Kobo or Barnes and Noble. 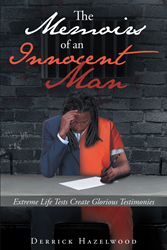 For additional information or inquiries about “The Memoirs of an Innocent Man: Extreme Life Tests Create Glorious Testimonies”, contact the Christian Faith Publishing media department at 866-554-0919.